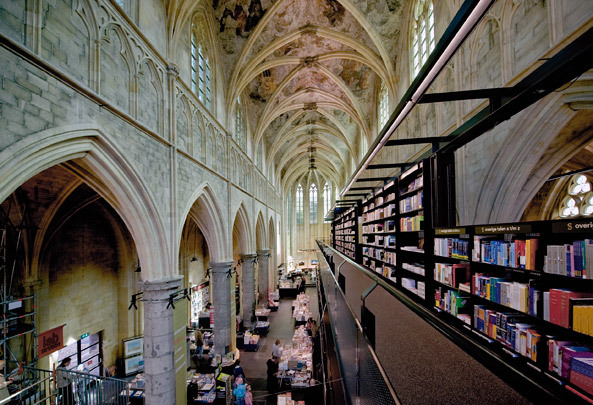 This large bookshop is housed in a disused Dominican church. The books are kept in a triple-height steel rack. Consisting of two bookcases with stairs and walkways in and around them, this furnishing unit is free-standing so as not to compromise the space of the original church. It is also placed asymmetrically, alongside the church's main axis, and incorporates one of the rows of columns. Its black steel, gauze and perforated balcony grilles cast the light-coloured walls and structure of the church into bold relief. The choir now does duty as a refreshment area. Low tables and display cases complete the scene.